Rockets News · Jun 26 Free Physical Night!! 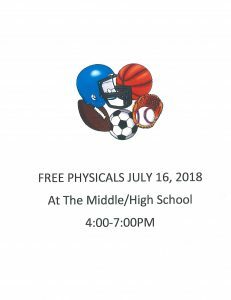 Reese Public Schools will be hosting a free physical night on Monday, July 16. Students that compete in athletics at Reese in grades 6 through 12 are required to have physicals on file dated after April 15 of 2018 in order to be valid for the 2018-2019 school year. All students are welcome, but parents must be in attendance as this is a medical exam. A waiting area will be provided for parents. Physicals will take approximately 30-45 minutes. Students must be in the building prior to 7:00 to get a physical. Please mark this on your calendar!